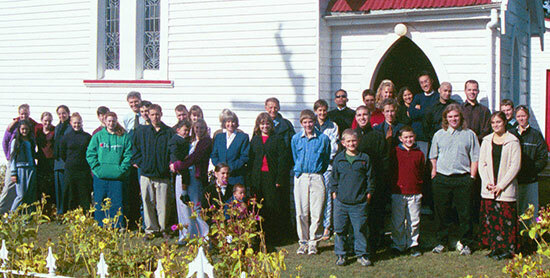 About 35 people attended this first Youth Bible Camp at Pinedale Motor Camp in the Wakamarina valley near Canvastown over Easter 2003. "Meetings have been really good - learning the doctrines are vital and personal messages are important." "Loved activities as they taught us very useful life skills (big thumbs up)"
"My favorite activity was the water sports. The St John was good, liked first aid." "There is no price for eternal life. I got more than my money's worth." And that's what Youth Bible Camp is all about! — having heaps of fun while getting to know each other and learning at the same time! Emanuel Baek from USA and Keala Estrella from Hawaii were the guest speakers. During the camp, Emanuel took some really interesting meetings on Bible doctrines during the morning Bible class times, they were really deep and Keala took meetings for the younger youth to present the Bible doctrines more at their level. Evening worships were great, Emanuel took an evening series on the Prodigal. When the weather was pleasant we sat round the camp fire outside and listened to the meetings. During these sessions Emanuel also told us some of his own story. Sabbath morning we went back to the start of the road to the little Canvastown church. Its basically a little country church that is not used much so we got permission to use it for the day. It was all wooden inside and Madelene Godfrey played the old pump organ which worked really well. Emanuel took two really interesting meetings. First he took a whole sermon on one Bible text (Matthew 13:44) sharing the simple parable of the man who sold all he had to buy the field with the hidden treasure. It was a challenge to give up anything that may be a hinderance to our spiritual walk and to seek the true treasure. The second meeting was called Pilate's 5 Mistakes. Manny gave this stirring message on the life of Pilate and the decisions he made during the trial of Jesus. He emphasised the importance of making the right decision now! We went back to camp for lunch and then went right to the end of the road and went for a walk on old gold tracks up a valley where there has been lots of gold diggings in the past. There were some really interesting places and we had lots of fun together. Activity time is always exciting. On the first afternoon the St John Ambulance people came and taught some basic principles of first aid. First there was an interesting lecture and then we did some practical excercises like reviving dummys. We all managed to pass our test and after the camp we received official St John First aid certificates. The next afternoon there was a bit of a disaster. We were busy learning about how to strap poles together and make stretchers when we had a radio call come in and we had to split into two groups and go find some of the other campers who had run into some trouble. One lot had fallen down a gold tailrace so we had to get down to them and access their injuries and help them out. We ran back to camp to get one of our stretchers to carry them back. The other lot had run into trouble over the river so after we found them and made a splint for one, we cleaned up the tomato paste blood and carted them back to camp through the river (it was cold!) Fortunately every one had a smile on their face at the end. On Friday we played some ball games and then had a really interesting challenge, we were given sheets of paper with photos printed on them and we had to find where that photo had been taken on the camp ground. Some were really random like a hole in the wall, an unusual tree, a bent piece of fence and a tap, some were pretty easy but others were quite hard. Sunday was really good. We spent the day out in the sounds and did some walking, water skiing and biscuiting, as well as having lunch there too. The food was good too. We all did our bit in preparation and clean up but the evening meals were lots of fun. One night we were given a pile of bread, a can of baked beans, a spoon, some paper and ONE match. That's all! Then we had to try to open the can and start a fire, cook the beans and toast the bread. All managed to get a feed in the end. Some beans got spilt, some didn't get very cooked and some of the toast got burnt, but it was heaps of fun. Another night we had an outdoor BBQ where we heated up lots of veggies and pineapple and made our own grilled hamburgers. I don't know why it always tastes so good like that, but I reckon it was the favorite! On one night, we were giving a really unusual menu to choose from. We didn't have a clue what each item was. It turned out that a green shower cap was actually lettuce, loose strings were spaghetti, hot rings was onion, moon chunks was pumpkin, lightening was a fork, a needle was a toothpick and there were lots of others too. Some people ended up with lots of food but no utensils, other had utensils and only one bit of food! For the second round we were starting to figure out what to order and finally we were all allowed in the kitchen to finish off! Apart from that the meals were all excellent. Angela and Lydia were excellent cooks! Each day we had our share of duties to do. These included serving, doing dishes, keeping the fires stoked up and making sure the toilets were stocked with paper and clean. We had evening walks in the dark up the road and often had one in the morning too. There wasn't cell phone reception for miles! Most of us were pretty tired out. Royce Hall even fell asleep with his Bible on his lap during one evening session! Also we had been split into groups earlier in the camp and each group had to prepare a special item for a concert we ran on the last evening. The camp caretakers and other campers using the ground also came along! We also had time to meet other campers and make real good friends!